Another year steps forward. What will you do with 2019? Let’s make it a year of triumph for Coshocton County – we are headed in the right direction on many fronts. Sure, we can all look around and find the negative in our community. I can do that at home too. This needs fixed, that needs replaced, and the roof has who knows how many years left? You get the picture. We are definitely moving forward in Coshocton County. Entrepreneurs are taking the leap to open new businesses while our manufacturers are adding workers throughout the community. Jobs are available is the point! A brighter mood of positivity is spreading with lots of folks working hard to make Coshocton County a better place to live, work and play. Throughout 2018 the news team at The Beacon – along with many others in our community – provided articles and photos that show Coshocton County at its best. That was our mission when the very first edition of The Coshocton County Beacon rolled off the presses on May 1, 2008 and it continues to be our mission going forward. To keep a community moving forward it takes a lot of people doing the right things. It takes more than those that are in positions of influence to maintain and grow a spirit of positivity. Our community leaders are, regardless of their organizational might, still only singular people. They need to know that they can count on all of us to help support and encourage them. Their job isn’t easy. There are hundreds, if not thousands of “Coshocton” type communities out there vying for industry and business. What makes us different? What can give us the edge? Good roads, bridges, and an overall solid infrastructure are all nice and certainly needs in today’s world. But at the end of the day, and not to sound too cliché, its people that make the difference. The contacts that you have around the community, state, nation and even the globe can all help us move forward – especially if they know that we believe in our community, our leaders and each other. Confidence can spread and grow beyond our borders with modern technology. Do you have a great idea that you want to share? Talk to the chamber director, the port authority director, village council members, the Mayor’s offices, County Commissioners, Our Town Coshocton or many others that can help take an idea and make it happen. Maybe your neighbor or a co-worker has an idea for a new business . . . encourage them to give it a try. The point is this. We are all in this together. We all believe that this is a great place to raise a family. I hear it all the time. We want our kids to come back here, find a job and raise their family in the same community that we know and love as adults. To make that happen we need a lively spirit of positivity. That can create jobs and a make a strong community even stronger. 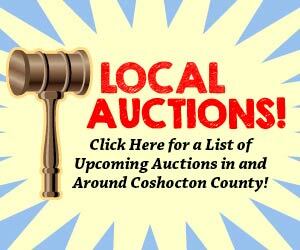 Go Coshocton County go! Let’s all help make 2019 a fantastic year.